Thomas Alderman was the 5th of 7 children of Richard and Ann Alderman who were married in Swanbourne in January 1773. He was the youngest of their three sons born in 1782. Thomas Alderman was a labourer in Swanbourne, and married Hannah Phillips in November 1805. Thomas and Hannah had six children, all sons, between 1806 and 1816. Two sons, who may have been twins, Thomas and Henry, were christened in Swanbourne on 9th November 1806. The family then moved to Aldgate Street in London where they had three more children: Robert Alderman, who was christened in St Botolph’s, London in 1808; Philip Alderman in 1810, and Jeremiah, who was born in Drury Lane about 1814. Around 1815 Thomas and Hannah Alderman decided to return to Swanbourne and their last child, Samuel Thomas, was born and christened in Swanbourne in May 1816. Philip Aldermen died in Swanbourne in 1828 aged 18 and Samuel Alderman died in Swanbourne in 1841 aged 25. In early May 1816 Thomas Alderman, aged 34, Joseph Cooper of Winslow, aged 28, and William Stevens of Granborough, aged 27, stole a wether sheep which belonged to brothers, Joseph and Matthew Robinson of Winslow. 1816 Criminal Register shows Thomas Alderman originally being sentenced to death. All three men were charged to appear before a jury on 19th May 1816. On 3rd July 1816 they were committed by the Magistrate to appear at the Buckingham Assizes on Monday 29th July, where the jury found them guilty and the judges Sir Vicary Gibbs and Sir Alexander Thomson, sentenced Thomas and his accomplice, Joseph Cooper, to death. The Calendar of Prisoners for Aylesbury Gaol says “Committed the same day (3rd July 1816), by the same Magistrate (William Selby Lowndes Esquire), charged upon the oath of the said Joseph Robinson and the said William Stevens their accomplice, and also on their own confession, with the feloniously taking and carrying away one wether sheep, the property of the said Joseph Robinson and Matthew Robinson”. 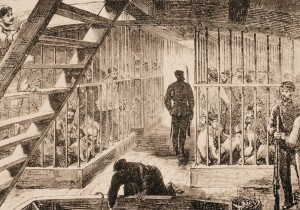 Prisoner ship transporting convicts to Australia. On 27th August 1816 both Joseph Cooper and Thomas Alderman were given a conditional pardon and their sentences were commuted to transportation for 7 years. 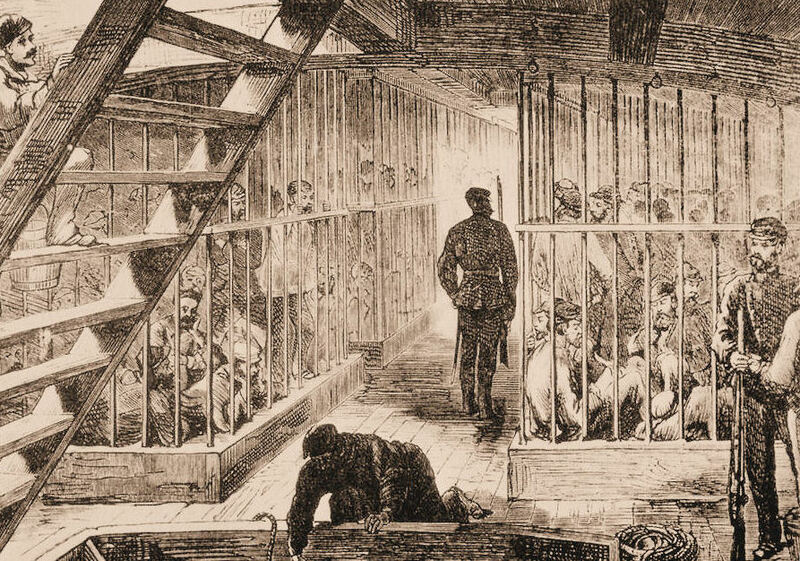 In November 1816 Thomas Alderman embarked on the S.S. Morley, bound for Australia, with 175 male convicts. 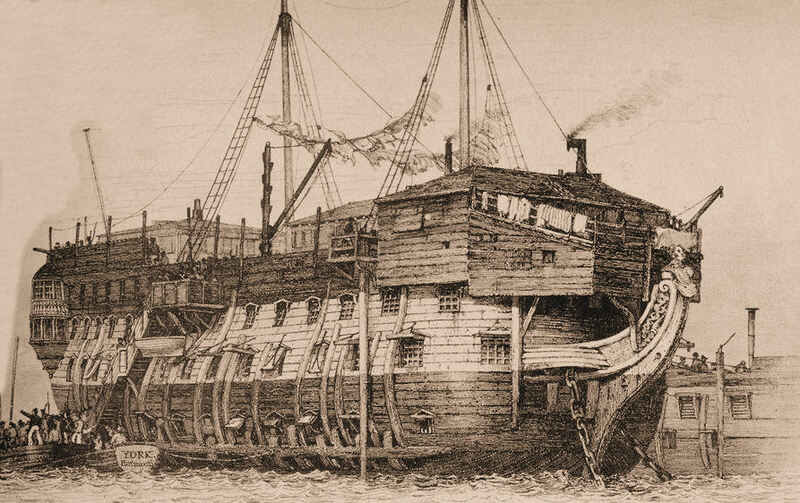 The ship sailed via Tenerife, Rio de Janeiro, Capetown and then onto Sydney where it arrived on 10th April 1817. On the ship’s manifest Thomas is described as a horse dealer, aged 34, 5’6” tall with a fair complexion, light eyes but dark hair. Engraving of a prison ship bound for Australia in Portsmouth harbour. From 1817 Thomas appears to have worked as a carter at Government House. He clearly conducted himself well and in 1819 he was granted his petition for a Ticket of Leave (bail) “to earn a comfortable Living by his own Industry”. In 1822, when he is recorded in a muster of convicts as a servant of T. Pryer, a shoemaker of Sydney, he is confirmed as ‘free by servitude’. In 1825 Thomas was working as a gardener in Sydney, and in the 1828 census he is recorded as a labourer, working for Elias Stranger at Kissing Point, Sydney, who had four servants and 20 cattle. Thomas Alderman died in the Government Benevolent Asylum in Paramatta, Sydney, New South Wales on 13th June 1863. Meanwhile in the 1851 and 1861 censuses Hannah Alderman calls herself a ‘widow’, maybe assuming that Thomas is dead because she hadn’t heard from him. One of their grandsons Ephraim Alderman (1836-1898) also went to Australia in 1855 as an assisted immigrant. He left Turton, Lancashire and arrived on 23rd May 1855 aboard the “Asiatic”. On the ship muster he is described as aged 18. On the list of passengers under “Relations in the Colony” it says “a cousin Charles Alderman” being his second cousin Charles Alderman (1823-1896) who emigrated with his family in 1855, and he does not mention his grandfather, so he may also have believed that he was dead. At that time the population of Sydney was about 50,000 and it is possible that their paths crossed, or that he found his grandfather. In 1860 Ephraim Alderman married Mary Hutchinson and they had nine children. In 1891 they were living in Western Road, Parramatta. Ephraim Alderman died in Parramatta, New South Wales in 1898 and his descendants still live in New South Wales.